In October 5th 2015 it is a celebrative date of NozzleBlack for their new development of inkjet CTP direct image system + UV double side exposure on the printer flat-bed (An inline CTP inkjet printer with main exposure + back exposure (3 in 1) which is one step ahead than Esco CDI Cantilever with main UV exposure only). This is a small step in laboratory of Team @flexo but it is a great step for flexographic printing industry. When first live demonstration of our CTP inkjet printer on All-In-Print 2014 Shanghai exhibition, FTI showed a 52x80 inch model, which can process the biggest photopolymer plate available in the world now from which sensitive flexo printers are able to smell the innovation of future plate making from it. As you may know that increasing strength of LED / UV is mainly depends on the new development of wafer, fluorescent powder and ratio of transforming from light to heat. Fortunately most of these are strong industries in Taiwan by which enable us to apply these technologies on our printer in order of Inline UV exposure. During TAPPI international forum + Sino corrugated 2015 exhibition held April in Shanghai, a flexo friend from America with his secretary stayed in our both with us for 3 days, who looked at our CTP inkjet printer very carefully and professionally. The inline CTP + double-side exposure unit idea was from his dream but we have made it true. CTP + UV printer now is available for sizes 42 x 60 inch (Model: 1080) & 52 x 80 inch (Model: 1320). Our salute to this friend from America ! PLC touch panel it is easy and clear to control the washout machine with solvent temperature control and solvent density checking device automatic release used solvent and replenish, the new fresh solvent with black layer removing washout tank for inkjet CTP and digital plate. All solvent contacted compartment we use all stainless steel for rust free. 1. How NozzleBlack CTP inkjet printer was created? Since LaserBlack enhance has created by Flexo Technology Inc. in 2006, we have about 20000 units used all over the world satisfactorily, some of the users are requesting for a new method to make bigger size negative film with good enough black density as LaserBlack enhancer. After it, there are so many CTF system to print on film in the market with special ink and special treated film as negative for photopolymer plate making. @flexo RD team was thinking more than that: a new technology can printing on any untreated film as long as it is a transparent substrate in order to substitute photo film. In addition, to be able to print image on photopolymer plate directly with no film / no vacuum for 100% successful jobs and labor / cost saving. Since it can print on any untreated film, therefore it is also can print on any surface of the photopolymer plate as well as on the screen frame, therefore the CTP inkjet printer was born in 2014, which is 8 years after the birth of LaserBlack. 2. What are the advantages to use NozzleBlack CTP inkjet printer? a. Use any conventional photopolymer plates for our CTP printer, no more Digital plates. b. No film cost only cost of ink. c. No vacuum, no dirty spot, no air bubble and no more failure. d. No turn-over for back exposure. 100% successful jobs. e. LED-UV exposure right after print to cure and harden the surface of plate. f. Good for high speed production of platemaking up to 30m2 each day. 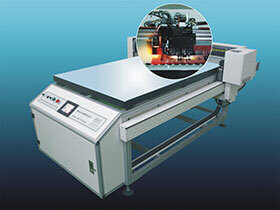 g. To get sharp image, save labor and time to reduce all process cost for you. h. The bigger the plate the easier to make. 3. How is the resolution and density from a NozzleBlack CTP inkjet printer? The opaque density is 3.50 which is good enough for any platemaking and as good as a photo film from an image setter with chemical developing processor. 4. Is the black image will fade / disappear and afraid of water? The black image printed of negative area is dry up immediately after an IR lamp blow with hot air which will never fade away and disappear. Due to use eco-solvent ink the image is not solved by water. 5. Shall we use special ink for NozzleBlack CTP inkjet printer? Yes, NozzleBlack CTP black ink is a super-black nano ink with a very thin layer to reduce the cost of ink consumption but still keep a high black opaque density to block the UV light during exposure. 6. How about ink consumption and print speed of a NozzleBlack CTP inkjet printer? 7. How about the fine resolution can we achieve? Color separation and screening jobs can be done by RIP software recommended by us. Fine screen dot can be done up to 85 lines per inch which is good enough for corrugated box printing and screen printing. Skilled engineers are not required any more for color separation / dot shape / ruling / angle all can be set by RIP software from your PC. Ink and cleaner are eco-solvent products environmentally green and friendly which contents non-toxic and not harmful chemicals. Ink and cleaner are packed in a ink pack of 200ml are available from us and our dealer, which can print 10-20 m2 of black image. Cleaner is consumed not so much only when cleaning the nozzle head normally. When force cleaning the channel and head it will used a little bit more of cleaner. Please note. Other ink and cleaner are not recommended for our printer to prevent block and damage of printer head. 11. Do we need to use digital plate for NozzleBlack CTP inkjet printer? For NozzleBlack CTP inkjet printer it is not necessary to use digital plate (with black coating), by just using conventional flexo plate is good enough and much economic for your platemaking cost. 12. After print, how to take off black ink to prevent pollution of washout chemical? a. It is easy to take black print away after exposure by a vinyl tape just stick and pull. b. To wash off by solvent first before washout the plate. c. New generation processor to wash off the black ink at first tank as for digital plate is required for an auto-washout machine. 13. Can we use any other ink to print? No, you can not use any other ink and cleaner for the channel and nozzle head make be blocked and damaged easy. Meantime your warranty also may be discontinued. 14. Black ink will dry quickly right after print? 15. Can we use any plate and film to print? Any conventional photopolymer plates can be used for direct CTP image on plate which will save a lot of labors, costs and time for you. At the same time, any transparent film without treatment can be printed as negative film on the flatbed as well. 16. What plate making else can we do with this NozzleBlack CTP inkjet printer? 17. Shall we adjust NozzleBlack CTP inkjet printer frequently? As mentioned the CTP printer will clean the nozzle head frequently and automatically, once you have set up the conditions and running smooth according to your production, it is not necessary to readjust the printer at all. 18. How about warranty from you? Using of any ink and cleaner other than Team@flexo product will be also exempt from our warranty. 19. Any tips to print fine and quickly for my plate making? A. Always to print following instruction and training from our engineers. Do not use any ink and cleaner other than our products which will block ink channel and damage nozzle head. B. CTP printer will clean frequently and automatically, which will keep the head in best condition to print. C. Paying more attention to ink and cleaner to see if it is enough for your daily job for mass production. 20. Any other suggestions from you to use this CTP for our mass production? No need to turn over the plate for back exposure and no vacuum for no failure. For your production under 10 m2 / each day we have good efficiency and economic Model: NB-1080. For mass production of 30 m2 / each day we have a high speed high performance printer for you with only a very little additive cost. Model: CTP 1550-4260 and CTP 1550-5280. 21. How about ink consumption and cost. Cleaners will be only used when it is auto-cleaning or charge-cleaning which is not much. Both ink and cleaner are supplied in a 200ml pack for good protection of quality and never dry up. Price are USD 50.- / pack of ink USD 20.- / pack of cleaner.